TRADERS at New Grain Market Kalamna celebrated Jhulelal Jayanti. with great enthusiasm. 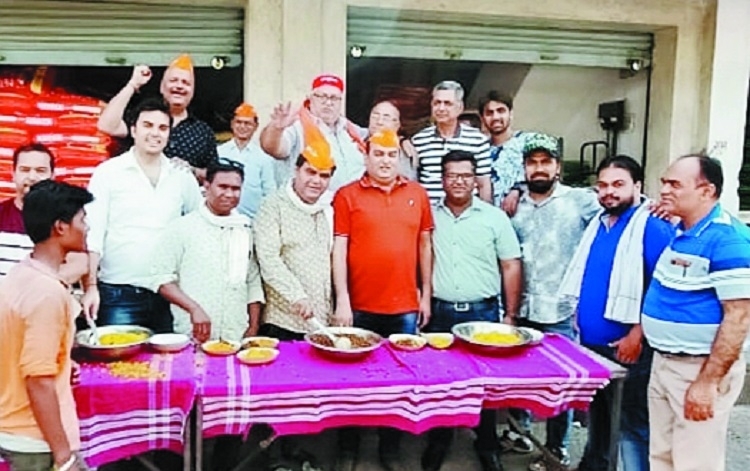 Pratap Motwani, Secretary of The Wholesale Grain and Seeds Merchants Association said, after performing pooja of Lord Jhulelal, Mahaprasad was distributed among the people from 1 pm. He told traders to always remain united. “Festival always bring traders together,” he said. The programme was organised at New Grain Market, Kalamna Market Yard, Building No 7. Shankar Motwani, Sandeep Motwani, Sunil Senani, Ritesh Gondhwani, Dilip Sachani, Sevak Sachdev, Rajesh Madrani, Balubhai Jagwani, Puneet Wadhwani, Kanayhalal Bajaj, Ajay Sachdev, Pawan Bajaj, Prakash Malani, Mahesh Thawani, Vinod Bajaj, Bani Sachdev, Manoj Ninawe worked hard for the success of the event.